Leah Kelley, editor-in-chief of The Guardian, says while newspapers are focusing more on online content she hopes the student newspaper will remain a printed paper. Its pages were laden with walls of text, blurry photos of a foreign-looking Wright State and ads for Dayton businesses that have long since closed their doors. 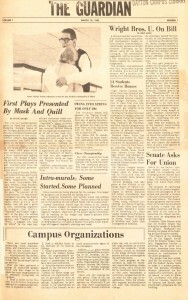 Articles reporting on the growth of university and editorials criticizing the Vietnam War filled the four-page spread. The year was 1965, and these were the contents of The Guardian’s first issue. 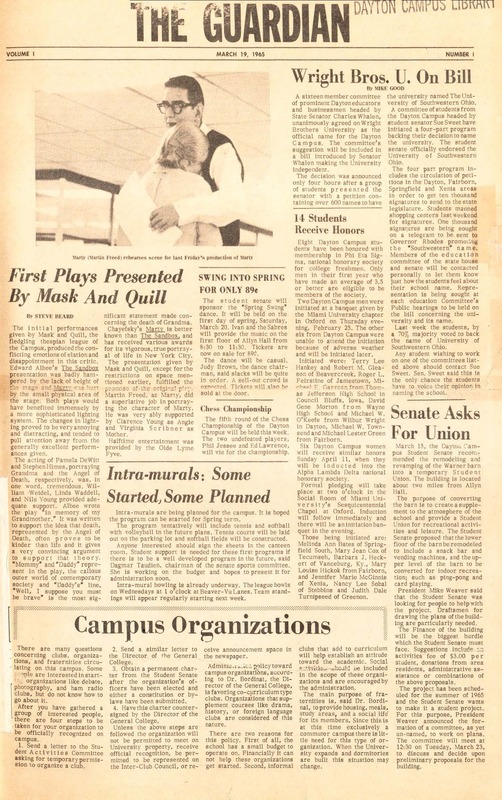 The first issue of The Guardian was published on March 19, 1965. The following half-century would transform the student-run newspaper in ways the original editors might never have imagined. In recent issues, The Guardian has become a polished and colorful piece of journalistic art. With high-resolution photographs, articles highlighting the ever-changing face of Wright State, riveting reports on national and international news, an advice column and much more, The Guardian has come a long way from its humble roots. 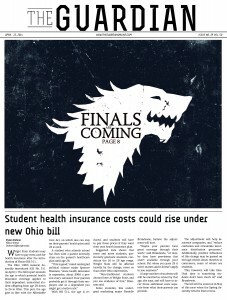 This academic year, the newspaper has reached a major milestone. 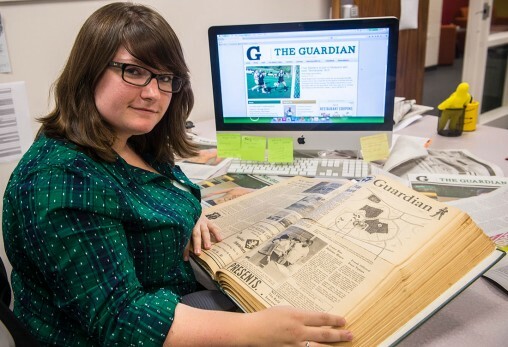 In the coming months, The Guardian will celebrate its 50th year of production — that is, half a century of publishing university news, events, sports and people, as one of Wright State’s most beloved media. Staffed by an ambitious team of writers, editors, photographers, accountants and businesspeople, The Guardian has maintained a longstanding tradition of student journalism at its finest. 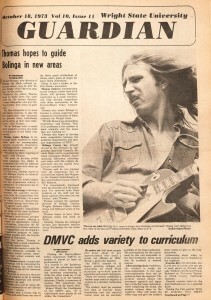 The Guardian has always provided thorough coverage of campus events and news. “In my time, The Guardian has evolved from a four-page black-ink daily to a weekly with as many as 32 pages, with a lot of color,” said Jeff John, Ph.D., associate professor of communication at Wright State. 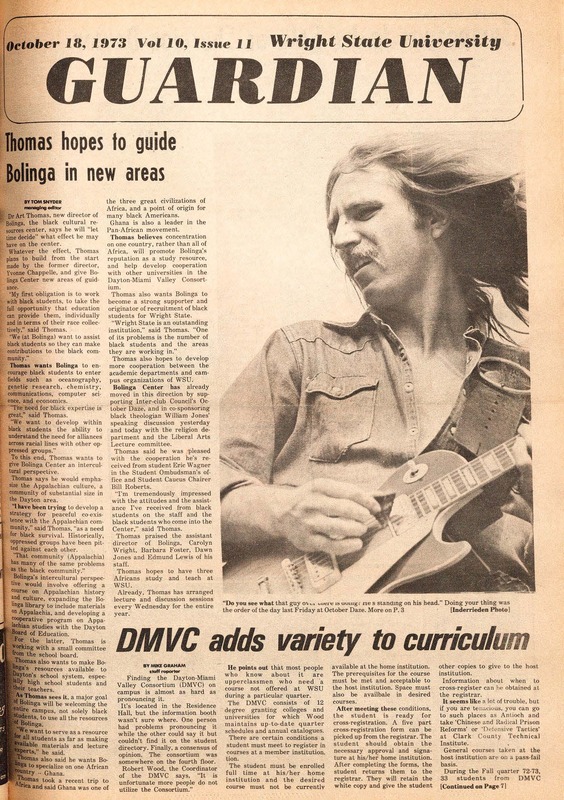 John has advised the newspaper for nearly 25 years, witnessing the substantial growth in every area of the publication: the quality of its content, quantity of publications, visual appeal of the design and engagement with the student body. “The paper has transitioned from outmoded production processes to state-of-the-art desktop publishing, acquired digital photography equipment and now publishes a digital version TheGuardianOnline.com, viewable on any device,” said John. 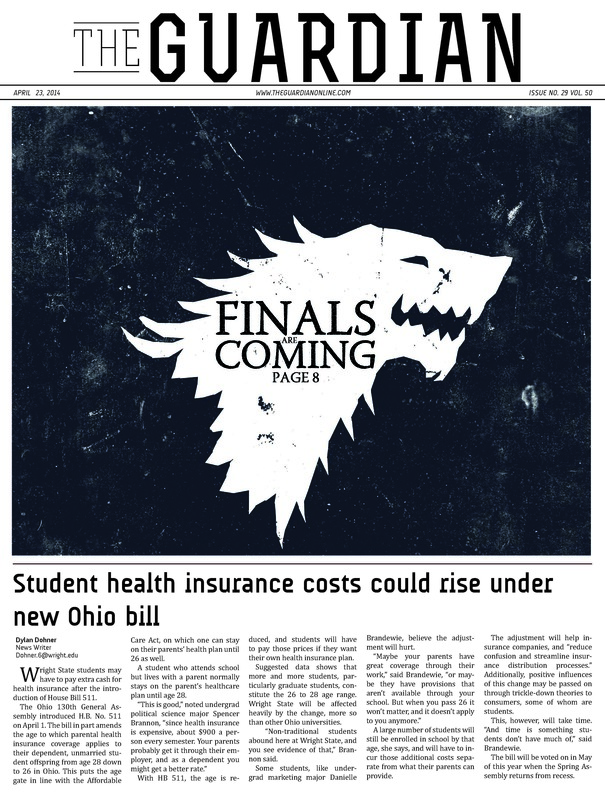 While The Guardian operates as a successful student organization, fulfilling its duty to deliver quality news content to the university, it is also one of the largest student enterprises at Wright State. The Guardian manages a budget of about $100,000 every year, John said. In spite of a shaky economy, the newspaper still works with dozens of advertisers to bring in the necessary funds to publish and distribute 5,000 copies of each weekly issue to 30 locations, on and off campus. 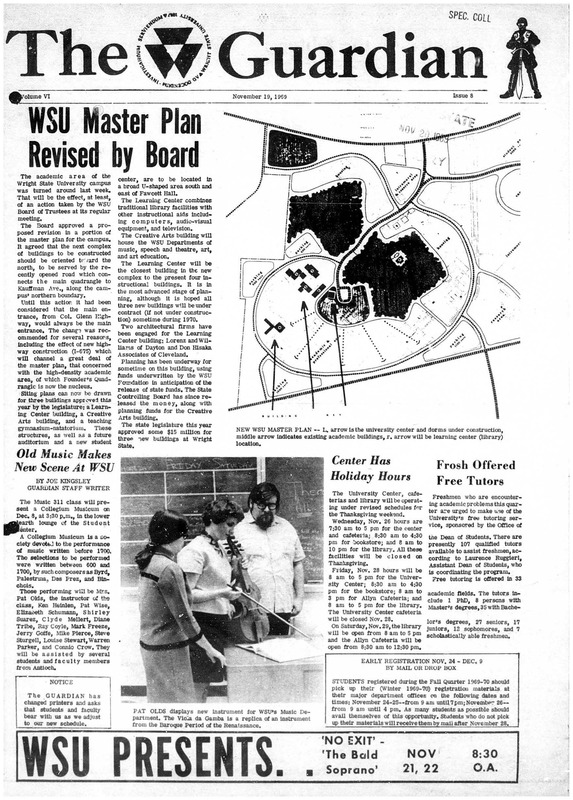 Archive issues of The Guardian are available on Wright State’s online Institutional Repository CORE Scholar. 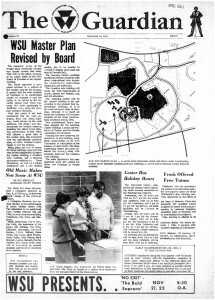 Joanne Huist Smith, Wright State alumna who was the paper’s editor-in-chief in the mid-1990s, is amazed at the progress the newspaper has made since her tenure. Although the form of the paper has changed, she says the spirit has never wavered. Informing the readership is the name of the game, says Leah Kelley, current Guardian editor-in-chief. But in a world where print journalism is on the decline and digital publications are sweeping the playing field, figuring out how to best meet student interests is a tall order. As it currently stands, The Guardian is known for its print publication more than its website — something unusual in the 21st century. The Guardian now publishes once a week and features high-resolution photos and art and articles highlighting Wright State news and events, plus national and international news. “However, I hope The Guardian always remains a printed paper that students can hold in their hands and read under their desk in class,” Kelley said. Read current issues of The Guardian at theguardianonline.com. Archive issues are available on Wright State’s online Institutional Repository CORE Scholar.